FoxTerm is a free multi-session terminal emulation application. Most applications that monitor and log COM port and Telnet connections force the user to open an application instance for each connection. This can be tedious and results in a cluttered desktop. 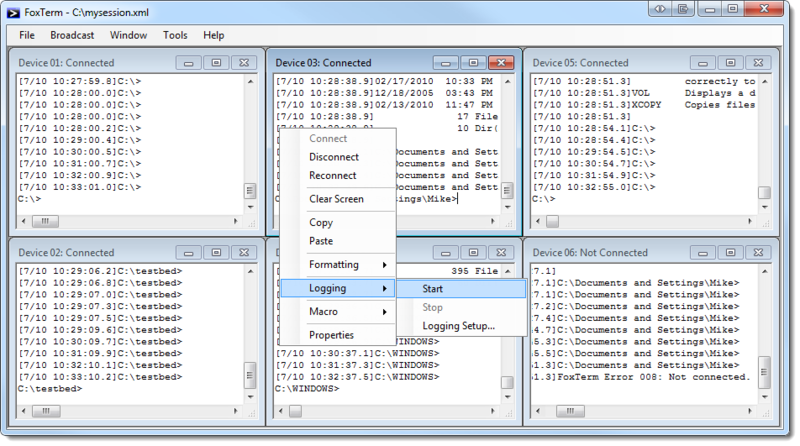 FoxTerm allows the user to create and open a session that contains multiple connections. FoxTerm supports loading an XML file that contains session information. When there are many connections, bringing up a session saves the user time over opening connections individually. The FoxTerm application comes with an XML example that contains comments detailing the supported XML elements and attributes. Starting and stopping logging is easy as there is one log button to start and stop logging on all connections. Logging in automatically is easy using FoxTerm's startup macro feature. Changes: 1. Fixed an issue where minimizing and then restoring the FoxTerm window would incorrectly invalidate the session, requiring a save. 2. Fixed a stack dump issue that could occur when using a trigger. 3. Added the BackgroundColor() and Reconnect() macro commands.